The Helix changed the game for digital amp modellers with an easy-to-use interface. The robust hardware made it popular with gigging musicians, and the sound quality is what has allowed the Helix to keep its popularity. Not only is it simple and functional, but it sounds great in lots of different situations too and is still available in both rack and floor unit formats. There are currently four versions: the Helix, the Helix LT and the HX Multi-effects unit and the newest one which is the Helix HT Stomp. We’re going to take a look at the differences between them! Intricate details about the Line 6 Helix product line. The difference between the Line 6 Helix, the Line 6 Helix LT and the Line 6 HX and Line 6 HX Stomp. The benefits of the powerful Helix multi-effects units. So, what are the differences between a Line 6 Helix and Line 6 Helix LT? The question on everyone’s mind will be ‘what’s the difference between the Helix and the Helix LT?’ You can look below for a chart showing all the differences but let me run you through some major changes. The LT is made of bent steel rather than solid extruded aluminium. The LT doesn’t have the small LCD screens below each stomp button. It does still light up in a colour corresponding to the effect. Yellow for distortion and green for delay etc. In Pedal Edit mode you can only edit in performance view on the LT. Whereas on the Helix you can edit on the fly. The LT has 2x sends and 2x returns in its effects loop. The Helix has 4x sends and 4x returns. The LT has 2 additional Bass/Guitar inputs and the Helix has 5. The LT has 2 additional Line inputs and the Helix has 4. The LT doesn’t have an XLR Mic Preamp but the Helix has the StageScape Mic Preamp. The Helix LT is the solution for someone who wants a slightly smaller Helix. It doesn’t have all the inputs and outputs you may need if you want to integrate it with a large pedalboard. Though you can still do so with a small board and the effects loops. It’s still got the same number of guitar and bass amp models. It still has all the effects, cabs and mic sounds from the Helix. It still has the stereo ins and outs that are so important. It still has the expression pedal and expression out for another one. The Line 6 Helix HX Stomp is the smallest in the range is incredibly powerful for what it is. It has 300+ effects and amp and cab models to give you a rig in a tiny pedal format. The difference between the Line 6 Helix HX Stomp and the HX Multi Effects is that the Stomp has got amp and cab modelling which means you plug it directly into an interface or PA system and get great guitar amp sounds whereas the HX Multi Effects has tons of effects to go on your board and replace your pedals or serve as a utility pedal. The HX Stomp has the same HX modelling technology as the main Line 6 Helix! It runs 6 processing blocks at one time (so you can run a few effects in the chain as well as amp modelling) but on the Helix you can run 12. So you’d need to decide which is best for your needs. This pedal is most certainly a gamechanger as it can sit on the end of your pedalboard and serve as amps and effects OR it can be your whole rig in one box. What About the Line 6 HX Multi Effects? The Line 6 HX Multi-Effects unit was released to give users the ability to get all of the effects of the Line 6 Helix without any of the amp modelling or cab emulation functionality. The HX Multi FX can be used as your standalone pedalboard or easily integrated into a pedalboard setup to give you access to pretty much any effect that you can think of. You can run up to 9 effects at once in a number of different ways. The drives will stack beautifully with each other or with your already driven amp. Normally analogue effects are very difficult for digital processors to replicate however digital processing has come a long way since inception and the powerful DSP chip in the Line 6 HX is now able to replicate the dynamics you’d expect from an analogue pedal. It’s worth mentioning that one of the hailed features of the Line 6 Helix was the quality of the effects and having these all available in a single unit was something that Line 6 fans and users have been calling for since the Helix was released. It’s also got the ability to host 4 different ‘Snapshots’. These Snapshots are essentially different settings for your pedals that you have loaded up and a Snapshot can allow you to hit a single button and change the settings on all 9 pedals at once – if needed. It is easy to see why someone would get confused when discussing the differences between the Line 6 Helix, Helix LT & and the Line 6 HX Multi-Effects unit but really, it’s quite simple. Line 6 Helix – The Helix is the powerhouse of the bunch. It has all of the features you’d need from a multi-fx, amp and cab sim unit and is also super-easy to use. The Helix is as powerful in the studio as it is on stage and even as a practice tool. It’s been designed to have everything a guitarist might need in one box. Line 6 Helix LT – The Helix LT does what it says on the tin – it’s the ‘light’ version of the Helix but still has all of the amp and cab sims available. It hasn’t got the uber-flexibility of the bigger Helix, however, it will easily cover all the bases that a pro musician would need to cover. Line 6 Helix HX Stomp – The Helix HX Stomp is the newest addition and sees the Helix squeezed into a pedal-sized chassis. It’s got 300+ Helix effects in a tiny format and has amp modelling unlike the HX Multi-Effects which is more of a powerhouse effects unit! 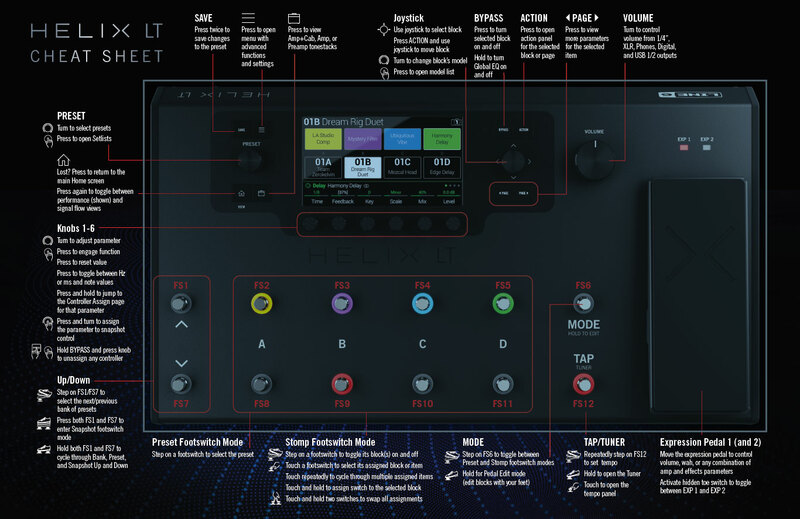 Line 6 HX Multi-Effects – Due to incredible demand from fans of the Helix, Line 6 decided to release an ‘effects only’ version of their Helix floor units. The HX captures all of their coveted effects in one unit and is your pedalboard replacement pedal. Or you could integrate it into an already existing setup. Want to find out how Line 6’s Helix range compares to other amp modellers? Read our ‘Axe FX vs Helix vs Kemper vs AmpliFIRE – Modelling Amps Shootout‘ guide now!